Termites are highly destructive insects that feed on wood. They rarely come out from the soil, mud tubes, or wood structures they’re inhabiting, so they can cause serious damage before they’re caught. If you’ve noticed termites or termite damage in your yard or inside your home, you should take action immediately to prevent the problem from getting worse. 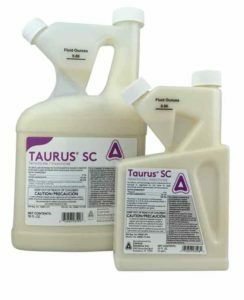 Taurus SC Termiticide/Insecticide comes in a 20-ounce container. The termiticide is highly concentrated, so it needs to be diluted in water. You should mix 0.8 fluid ounces of the chemical with one gallon of water. The 20-ounce container should make 24 gallons of termite-killing solution. To use the solution, you need to dig a 6-inch trench around the entire perimeter of your home. Pour the solution into the trench, using about four gallons for every 10 linear feet. With this product, keep in mind that a stronger solution isn’t necessarily better. Don’t mix more of the termiticide with a gallon of water than is recommended in the hopes that it will do a better job. Termites may detect and stay away from the solution if you use too much termiticide, so it won’t effectively kill them off. Also, the product isn’t meant for indoor use. You can apply it inside of your walls if you have an active termite infestation, but you shouldn’t pour it anywhere else in your living area. Taurus SC doesn’t just repel termites. In fact, termites can’t smell or detect the chemicals at all. After you use the solution, the termites may still cross the barrier into your home. However, they’ll make contact with the chemicals and ingest them. Then, they’ll bring the poison back to their colony and infect the other termites. Eventually, the entire colony will be killed off at the source. It will probably take a couple weeks for the termites to start dying off, and the full effects will be achieved in 90 days . Although it’s not as fast-acting as some other treatments, it provides long-lasting results because it gets rid of the entire colony. It also works on most species of ants and other pests like wasps, centipedes, and cockroaches. This termite killer will take more time and effort to apply than some of the other products, so you should only buy it if you know that you’ll commit to following the instructions. If you don’t surround your entire home with the solution, it may not work. You’ll have to take the time to dig a trench, mix gallons and gallons of the solution, and carefully pour it around the perimeter of your home. Taurus is completely safe to use around pets. Its active ingredient is Fipronil, which is the same active ingredient that’s in many different flea medicines for cats and dogs. 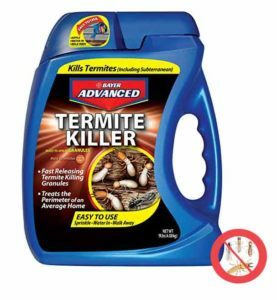 You don’t have to worry about letting your pets outside after applying the termiticide. Taurus has excellent reviews from people who have had severe termite infestations. It’s highly recommended for people who are willing to put in the time and effort to treat their home . Talstar Pro comes in a 96-ounce container, which is more than enough for covering the average-sized home and yard. Its active ingredient is bifenthrin, which is a very effective pest control. In addition to killing termites, Talstar Pro can also take care of over 75 other pests, including cockroaches, mosquitoes, and fleas. If you have multiple pest problems, this product might be your best option . You can use Talstar Pro indoors and outdoors. Once it’s dry, it’s safe for pets. It’s water-resistant, so you don’t have to reapply it to your yard after it rains. It also leaves a long residual, so it will continue killing pests for up to three months after it dries. 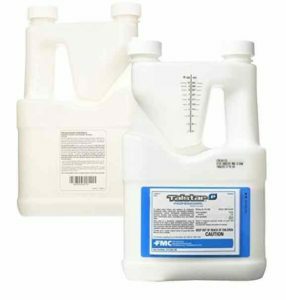 Talstar Pro is a concentrated solution, so you’ll have to dilute it with water. The manufacturer recommends mixing between 0.3 and 1 fluid ounce with a gallon of water . Using too much of the pest killer in a gallon of water can be dangerous, especially if you’re using it indoors, so you should carefully measure it. Don’t use more than 1 fluid ounce per 1,000 square feet. The product is meant for spot treatment, so it works best when sprayed into cracks and crevices, baseboards, under kitchen appliances, in wall voids, and in other places where termites hide. If you’re planning on using it in wall voids, the manufacturer recommends mixing in a foaming agent to help it stick to the walls. To use it outdoors, spray it thoroughly around the perimeter of your home. Although Talstar Pro is safe to use indoors, it does use strong chemicals, so it’s important to be safe. When using the product, wear long a long-sleeved shirt and gloves to prevent skin contact. Use eye protection and open the windows in your house to provide ventilation. Wash your hands thoroughly after using the spray, even if you don’t think it made contact with your hands. Make sure you, your family members, and your pets don’t make contact with the solution until it’s dry. You can use the spray in the kitchen, but you’ll have to store away any food to prevent it from being contaminated. The product doesn’t come with a spray nozzle, so you’ll have to buy a one-gallon spray bottle. You also may need to reapply it a few times to see good results. You shouldn’t reapply it more than once a week , but it may take a few weeks and a few reapplications to completely get rid of the termites. Talstar is one of the oldest and most well-known pest killing brands. Thousands of people have had great success with the product, and it should work well if you follow the instructions. 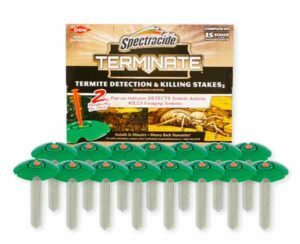 Spectracide Terminate comes with 15 stakes that detect and kill termites. Most people don’t notice a termite infestation until lots of damage has been done, but this product will notify you of termite activity as soon as it starts. Each stake has a bait that will attract and kill termites. The termites will also bring the pesticide back to their colonies and spread the poison to the rest of the pests. When a termite takes the bait, the termite indicator will pop up, so you’ll know to start investigating. The product comes with graph paper, so you can make a map of your house and plan where to place the stakes. Identify places around the perimeter of your home where termites might gather. This includes places with lots of moisture, like air conditioning lines, spigots, and poor drainage areas. You should try to put the stakes in these high-risk areas, but you shouldn’t place two stakes less than 10 feet apart . If your home is less than 1,200 square feet, you’ll need about 10 stakes for total coverage. If your home is larger than that, you’ll need 20 stakes. The package only comes with 15, so you’ll have to buy a pack of five extra stakes. You’ll also get an auger in the package, so you can easily drill holes for the stakes. Place the stakes two or three feet from the foundation of your home. When you see the pop-up indicator, check the stake to see if termites have eaten the bait. If the bait is gone, you’ll need to replace the stake. You should check all of the stakes at least once every three months for termite activity, even if the pop-up indicator hasn’t been activated. All of the stakes will need to be replaced once per year. Spectracide Terminate uses strong chemicals, so you need to be careful when installing and checking the stakes. Use gloves and protective goggles, and wash your hands right after handling the product. The chemicals may also be toxic to aquatic species, so you can’t put the stakes near a stream, pond, or another water source . If you live right near a water source, you should probably choose a different product. Spectracide Terminate does kill termites, but it’s more effective for detecting and preventing infestations than for getting rid of severe infestations . If you already have an active infestation, you should combine the Spectracide product with another termite killer to handle the problem. However, if you’re just worried that there might be termites around your home, Spectracide Terminate is a great way to find out and to kill termites before the infestation gets too bad. Bifen XTS comes in a 32-ounce container. Its main ingredient is bifenthrin, and it works just like the Talstar product. However, it has a stronger concentration of bifenthrin than Talstar. Bifen XTS can be sprayed indoors or outdoors. To use the product, combine 0.3 ounces with a gallon of water in a spray bottle. Spray it around the perimeter of your home to kill termites that try to enter the area, or spray it in the cracks and crevices inside your home where termites might live. Bifen XTS contains a strong concentration of bifenthrin, which can be harmful if you don’t follow the manufacturer’s instructions. Don’t mix more than the recommended amount of the product with a gallon of water, and don’t spray it more than once a week . Protect your skin and eyes when spraying it, and open all the windows in your home for ventilation. All humans and animals should leave the room while the spray dries because it can be harmful if inhaled. Wash your hands after spraying the solution. This product is oil-based, so it can be harmful to plants. If you use Bifen XTS outside, avoid spraying the solution directly onto your garden. It may be harmful to aquatic species, so you shouldn’t spray it near any water sources . The chemical may also stain vinyl siding, so you should test the solution on a small piece of siding before spraying a larger area. There will be a strong odor for a few hours after using the product, but it will go away as the solution dries. 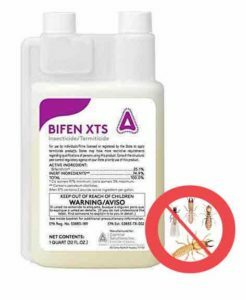 Bifen XTS uses fast-acting chemicals that will affect a termite’s nervous system and kill it within 24 hours of contact . It should take care of a termite problem quickly and efficiently. It also can kill over 50 other types of pests, and it can prevent future infestations. After it dries, it will leave a residual for up to eight weeks, so any termites who make contact will be killed. The 32-ounce container should be plenty to cover your entire home and yard multiple times, so it’s a very cost-effective product. It’s highly recommended for active infestations as long as you can follow the safety instructions. Bayer Diy Termite Killer is a 9-pound container of termite-killing granules. The container should treat about 200 linear feet, so it should cover the average-sized home. To apply the product, all you have to do is sprinkle the granules onto the ground into a 6-inch band around the perimeter of your house. Then, water the granules with a hose until they’re moistened, but there shouldn’t be any runoff. The water will make the granules disintegrate and release the active ingredient into the top layers of the soil where there’s termite activity. The active ingredient in the product is imidacloprid, which affects the pests’ central nervous systems. Any termites that make contact with the soil will be killed . The chemical is much less toxic to humans and other mammals than it is to insects, so it should be harmless as long as you follow the instructions on the label. Once the product dries, it’s safe for humans and pets to make contact with. Bayer Diy Termite Killer should last for months. Instead of simply repelling termites, it will kill the pests in the soil, so it provides a permanent solution. It’s also one of the easiest termite killers to use, so it’s great for people who want a simple treatment. You don’t have to dig a trench, measure out a concentrated product, or spend hours spraying your home or yard. Most reviewers say that all the termites in their yard were gone just two or three weeks after using the product . This termite killer is meant for outdoor use only, so it won’t help with an infestation inside your home. Although it’s safe to use around humans and pets, it works by disintegrating into the soil, so it will be useless indoors. It will prevent more termites from entering your home, but you’ll need to use another product if you have termites in your walls. Bayer Diy Termite Killer isn’t the cheapest product on the market, but it’s a great option for preventing termites in your yard from entering your home. If you want an easy-to-use termite killer, this might be your best choice. It’s important to buy a termite killer that meets your needs. There are a wide variety of different products that work in different ways. Some products are definitely better than others, but your choice should depend on your individual circumstances. How do you know which termite killer is best for you? 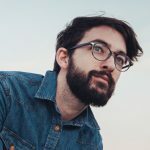 It depends on how bad the infestation is, whether you need indoor or outdoor treatment, and how much effort you’re willing to put into using the product. Some termite killers mostly work as bait, and others are repellents. Baits will attract termites, but they also contain poisons that will kill off the pests. Some will kill the pests quickly, and others will give the termite time to return to its colony and infect other termites. Repellents contain chemicals that will keep the termites away and prevent them from entering your home. However, they won’t kill the pests, so they won’t eliminate the source of the problem. Generally, it’s better to use a product that actually kills the termites. The best products are usually slow-acting enough that the poisoned termites will spread the pesticide to the rest of the colony. You also need to determine whether you’ll use your termite killer indoors or outdoors. If you’ve seen termites outside, the first thing you should do is search your home for signs of an infestation. You might hear quiet clicking noises coming from your walls or see discarded wings near windows or doors. If the infestation is severe, you may see wood damage behind your walls or under your floors. Some products are only meant to be used outside. These termite killers are good for controlling an outdoor termite problem and preventing them from entering your home. However, if your home is already infested, you’ll have to buy a product that can be used indoors. If you have young children or pets, make sure you use a brand that’s non-toxic. Most products contain strong chemicals, so you should always be careful. Some are safer than others for indoor use, though. Check the label for safety instructions, and Google the active ingredients to see if they’re safe to use around kids and pets. If you can’t find the information you’re looking for, try contacting the manufacturer before buying the product. The first step to taking care of a termite infestation is buying a good termite killer. 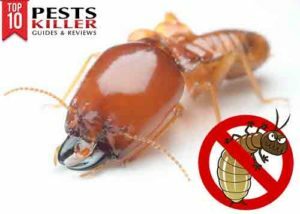 All of these products have great reviews and should effectively kill termites. You should do your research and make an informed decision, though. For indoor infestations, Talstar Pro or Bifen XTS are probably the best products. For an outdoor infestation, you should probably use Taurus SC Termiticide/Insecticide. If you want a product that’s easy to use, Bayer Diy Termite Killer might be the best option. No matter which termite killer you choose, you should do your research and follow the manufacturer’s instructions to get the best possible results.